A guide to "Constructive Disobedience"
To confront the Establishment head-on, and bring about the Progressive Europe that is desperately needed, we call on activists everywhere to practise “Constructive Disobedience”. What do we mean by this? Read on to find out. 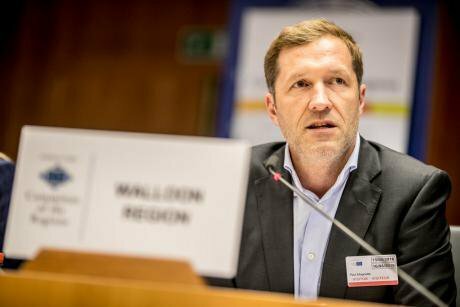 Paul Magnette, Minister-President of the Walloon Region, famously held up the passing of CETA at an EU level in 2016. Flickr/European Committee of the Regions. Some rights reserved. We founded DiEM25 on the belief that the EU is disintegrating due to the incompetent authoritarianism of its institutions and, more generally, of Europe’s ‘deep’ establishment. A negative reinforcement mechanism between authoritarianism and failed policies feeds the centrifugal forces tearing Europe apart, with Brexit just the prelude. To jolt Europe out of its path to ruin (i.e. a disintegration that will only benefit xenophobic, nationalist, regressive forces) we propose that municipalities, city councils, regions and governments practise Constructive Disobedience. But what does this mean? What should be disobeyed and how can disobedience prove constructive, as opposed to deconstructive? The EU establishment, at least since the euro crisis erupted following the 2008 global financial crisis, has chosen to implement policies and to issue directives that violate basic principles that a defensible and sustainable EU should espouse. Such policies or directives whose implementation will damage the EU’s long-term image and integrity must be disobeyed! Disobeying such policies and directives is a Europeanist’s duty – rather than the un-European reaction that the establishment portrays it as. Disobeying policies or directives that damage Europe’s integrity is necessary but insufficient. To be progressive and constructive, we must accompany disobedience by counter-proposals fully outlining alternative policies or directives to those we disobey. These alternative policies or directives must, in addition, be universalisable (in the Kantian sense of being the policies one should want to see adopted, at once, throughout Europe). In other words, our disobedience does not qualify as constructive if the alternatives we propose are based on the NIMBY (Not In My Back Yard) syndrome, or are of the type that, if adopted in every country, some parts of Europe will suffer. The Irish governments’ long-term policy of offering multinational big tech and pharma companies sweetheart corporate tax deals, and disobeying the European Commission’s directive to end these deals, does not qualify as Constructive Disobedience. Why? Because the Irish governments’ policy fails the universalisability test: If every EU member state offered such deals to Google, Apple, etc., these companies would have no incentive to stay in Ireland. Ireland would then lose its gains but the benefits to Europe as a whole from giving these corporations effective tax immunity would be grossly overshadowed by the loss of aggregate taxes. The refusal by various governments (like Hungary in 2017) to accept its allotted share of refugees. Again, while this is an example of disobedience, it most certainly fails the universalisability test: If every member-state refused to take on refugees (something that in the cases of Greece and Italy would involve unspeakable brutality at high seas), Europe would violate its international treaty obligations, not to mention its self-image as a civilised continent. The Italian government’s demand in 2016 to be allowed to violate the EU’s ‘fiscal compact’ budget rules at will, while consenting to the proposition that other countries (e.g. Greece) are subjected to calamitous austerity. By definition, this form of disobedience cannot be universalisable, as it seeks to exempt one country from strictures that the ‘disobeyer’ agrees to see imposed on another country. To render the Italian government’s disobedience constructive, Prime Minister Renzi would have to outline in full counter-proposals regarding: alternative fiscal rules, a proper banking union, aggregate investment policy for the eurozone as a whole and, last but not least, a European policy of public debt management. Wallonia’s disobedience to CETA in 2016 passes the test of universalisability, thus qualifying as an example of Constructive Disobedience. Its objections focused on the establishment of private tribunals where governments and municipalities could be fined by multinationals outside the purview of Wallonia’s legal framework. Wallonia’s success at blocking CETA would not just benefit Wallonia’s democratic sovereignty but would act as a shield for the democratic sovereignty of every member state or region of the EU. In so doing, it would enhance, rather than imperil, Europe’s integrity. The Greek Spring of 2015 was another example of Constructive Disobedience since: (a) the troika-inspired fiscal and reform program that the Greek government was disobeying was the template on which the policy of universalised (pan-European) austerity had been built, inflaming a pan-European deflationary crisis detrimental to every member state in Europe (including Germany); and (b) the counter-proposals of the Greek government (e.g. on debt swaps, low but positive primary surpluses and reforms that targeted the oligarchy) would have been beneficial to Greece without jeopardising the well-being of any other member state (indeed, they would have benefitted the rest of Europe by helping Greece repay a larger portion of its debt). The Italian government’s 2016 threat to veto the EU budget unless there is a common migration and refugee policy is consistent with the universalisability test: If every member-state threatened to do the same, and toward the same objective, Europe would be jolted out of its present scandalous lack of a common, coordinated policy on migration/refugees! During the standoff between Wallonia and Brussels over CETA, commentators were lamenting that a small Belgian region should have the right to hold out against the rest of the EU, making EU-level decision-making impossibly inefficient. But what are they proposing? The only way of making pan-European decision making more efficient is by transferring the sovereignty of state or regional parliaments to a federal, pan-European parliament. To withdraw now (before a sovereign federal parliament is instituted) the right of regional or national parliaments to say ‘No’ to the loss of their sovereignty is to end even the pretence that we live in democracies! As long as there is no democratic process at the heart of the EU, it is intolerable to force upon parliaments (like Wallonia’s) the loss of their sovereignty just because the ‘majority’ of other parliaments demand it. This is equivalent to banning Constructive Disobedience of cities, regions and member states well before a truly federal system is vested with democratic sovereignty. Democrats across Europe must oppose such barbarity… with all their resolve.